Turmericle® is a unique golden powder blend that combines all of the benefits of turmeric, coconut oil, resveratrol, and ground black pepper in a convenient and easy-to-use powdered form. The first ingredient, turmeric, is known for its powerful antioxidant properties, and may help your horse’s body neutralize free radicals before they damage healthy cells and cell membranes. In addition, it supports a normal inflammatory response and may help your horse stay comfortable. Next, this formula contains Power Stance®, which is Stance® Equine's unique powdered coconut oil supplement. This key ingredient helps ensure the proper absorption of turmeric and supports your horse's overall health and well-being. For additional antioxidant support, this formula provides resveratrol. Finally, ground black pepper is included to support the absorption of turmeric. 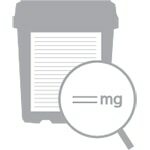 Turmericle® Powder is rated 4.8 out of 5 by 8. Rated 5 out of 5 by Jamey from Amazing Product for all the horses! Per recommendation we began feeding this product to 3 different horses to see what benefits we could see. Horse 1: 10 year old Open/Rodeo barrel horse, after three weeks of feeding noticed less stiffness, hocks not getting puffy after runs or hard work outs and much more fluid in movement. Horse 2: 4 year old futurity barrel horse horse, after three weeks of feeding, outran the open horse. Need I say more! Horse 3: 18 year old head horse, has been laid up due to a torn tendon sheath, had surgery and strained collateral ligaments in knee. He had been off for about 8 months and was due to go back for final ultrasound and knee injection. About a week prior we started him on the tumericle, at which time there was still noticeable inflammation in the knee and he was pretty stiff. When we arrived at the vets they were astounded that there was no inflammation in the knee and he was sound. He has been released to rehab and encouraged that whatever we were doing that this 18 year old campaigner horse that has been on stall rest for 8 months from injury could come out and be sound to keep doing it. He has now been on it for 2 weeks and is getting legged back up and feels great! Swelling in the knee has subsided still and we cant wait to get him back in the roping pen. I was shocked with how palatable this product is also. We feed it with the coolstance copra (also a wonderful product we have been feeding for years). I was kind of nervous the first day if they would even touch it and all three horses never even though twice about it and gobbled it up with no objection! In all three of these horses the only change that was made was the turmericle, so with confidence I can say we will be ordering more and to continue keeping these guys feeling their best! Rated 4 out of 5 by Rose from great initially my horse wasn't sure of the flavor, but I started with a smaller amount, less than the recommended dose and built up to the full amount, now she eats it no problem. She struggles with constant stocking up and other inflammatory issues. I've tried lots of things, not much seems to work, but I think this definitely helps. Rated 5 out of 5 by Saddle Creek Stables from Gods Gift to injured and or arthritic animals! I have had my horse on numerous Tumeric products as I have always believed in its use. I see results! This product is really easy to feed and is gobbled up every time. I use some alfalfa pellets and my usual feed. The pellets help make a mash when the water or Flaxseed oil is added. I think every horse, especially performance, horses should be on this for maintenance and/or healing or chronic injuries. My horse can now carry himself much better so his top line is coming back. The protein from the alfalfa helps with that as well. But since he doesn’t seem to hurt anymore he is much more active. (Retired roping horse with arthritic jocks and shoulder) It is strong flavored.. start slow with other feeds the horse likes! Rated 5 out of 5 by mkcampbell from Update number 2! This is my third review of this product because I can’t say enough good things about it. Dabble is a blood bay and he’s usually the color of a shiny copper penny. Well, not only is he SUPER shiny now, his coat is now a deep copper color. He looks great and feels great! I didn’t think I would be able to compete in one more derby with him, but with the help and support of my vet, farrier, and SmartPak, we are on the right track to the derby! Rated 5 out of 5 by mkcampbell from Update! I already wrote a review about a month ago on this product for my horse, Dabble, but I thought I would give you all an update! After putting four shoes on him and adding this product to his supplements, he's getting so much better! I took him on his first trail ride in MONTHS yesterday and he did great! Dabble was diagnosed with a mild bowed tendon in December of last year and he required rest to recover. He would show signs of improvement, then show signs of lameness again. This went on for months. Even after cranial-sacral therapy appointments. He's on a joint combo, Equioxx, flax and others. After adding Tumericle to his supplements, he's doing fantastic. If your horse is showing signs of lameness and nothing else seems to work, I highly recommend this! This product gave me my 26 year old spunky Morgan back. Rated 5 out of 5 by mcampbell from Yum! I just gave Dabble his first dose this evening and he ate it right up! He’s normally not a fan of powered supplements, so I was very pleased! Hopefully he’ll continue to love it! Thanks again, SmartPak, you all are the best and Dabble agrees! Rated 5 out of 5 by DebraSF from Great Product! I have been feeding this to my 22 mare for the last year. she had some issues with irritable bowel syndrome plus frequent urination. Since I have been feeding this, the frequent urination has stopped and her bowels have greatly improved. Her coat shines and she move like a 10 year old. I attribute this to Turmeric's natural ability to calm inflammation. I love this product it has the coconut oil and black pepper that is required to activate the Tumeric and make it bio available. My horse has no issues with the flavor, I doubt she even knows it is there. You do need to feed it 2x a day for the best results. 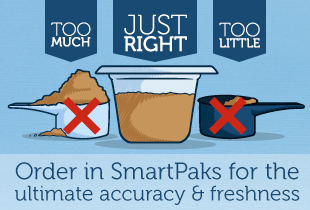 I can now save money with my smartpaks discount and no shipping.